On Saturday, July 19, 2014, at the ripe old age of 43, I skated my last game as a roller derby competitor. JoeMac-RainbowWicked caption: Rainbow Dragon and Wicked Pissah team up to slow down Highland Dames jammer Viola Streak. Photo courtesy of Joe Mac, Midnight Matinee Photography. I blogged last year about my early experiences with roller derby, from lacing up my skates and donning protective gear for my first practice to working with my league mates at Crow City Roller Girls to present the first ever roller derby game in Chatham, Ontario. These were good times in my life. I loved skating with Crow City, and my life was enriched greatly by the experience. But alas, the old adage proved to be true of my favourite sport: roller derby is a harsh mistress. Training to play this sport is a huge commitment. Add to this the large amount of work—all of it voluntary—required to run a successful league and many skaters are forced to conclude there is not room enough in their life for roller derby. In a league the size of Crow City, with so few shoulders available to carry the load, this problem is magnified. As other skaters left us, I took on more and more of the work of running the league. Nobody forced me to do this. I accepted every new responsibility willingly because I loved the sport and loved my league and wanted it to succeed. I took on too much. I soon discovered I was sacrificing far, far too much of the rest of my life to play roller derby. And I could not continue to make those sacrifices. I needed to make a change. That change came on October 31, 2013 when I resigned my membership in Crow City Roller Girls. It was a difficult, painful step to take, knowing that in walking away I was hurting people I loved and exacerbating the very problem which had driven me out. It was a step I took with a heavy heart and only because it was my only viable choice. Not wanting to give up roller derby entirely, I then transferred my membership to a much larger league in London, Ontario: Forest City Derby Girls. I loved training with Forest City. I loved being able to simply show up to practice and participate in drills prepared by other people, no longer required to plan and lead the practices myself. I loved training with a league so large we were able to scrimmage in practice almost every week. And I loved training under the guidance of Forest City’s excellent trainers who gave freely of their own time and expertise to help me improve my game. I remained diligent in my efforts to keep my participation in the work of running my new league under control. Many hands make light work, and the size of Forest City enabled me to succeed in this regard. Commuting over 100km to attend twice weekly practices, however, proved to be too costly for me in both money and time (and this before I factored in the costs of travelling to away games). Six months after my transfer to Forest City Derby Girls I once again found myself searching for a new way to keep my involvement in roller derby alive. Several members of the derby community had suggested refereeing to me in the past. They thought I would make a good “zebra” because I’ve always had a strong understanding of the many and often complex rules of our sport and I certainly possess the endurance required for the role. (Referees skate every jam.) I’d rejected these suggestions in the past because I was under no delusions that the role of roller derby referee is easy. It’s one thing to know the rules. It’s another entirely to be able to see them in action and read points and penalties on the fly as a fast-moving pack of skaters jockey for position on the track. I was already giving everything I could to the task of learning to be a better roller derby player. I knew I could not excel at both playing and reffing. But if I gave up playing roller derby? Could I develop the skills necessary to become a great referee then? Once again I needed to make a change. So I exchanged my rainbow stripes for black & white and decided to give it a try. Southern Ontario is a great place to be a roller derby referee. We have many leagues who need officials for their games and many experienced and talented refs already in the area, willing and able to help train the next generation of zebras. I made the decision to join the zebra dazzle on May 3rd and reffed my first game on the 24th of the same month. Since that date, my officiating schedule quickly filled up, giving me opportunities to skate with many fine ref crews while still maintaining a travel schedule I could afford. My decision to join team zebra enabled me to keep skating, remain involved in a sport I love, and find that elusive but much-needed derby/life balance. It also sent me back to The Fresh and the Furious. The Fresh and the Furious is a tournament for new skaters hosted by the GTA Rollergirls in Toronto, Ontario. 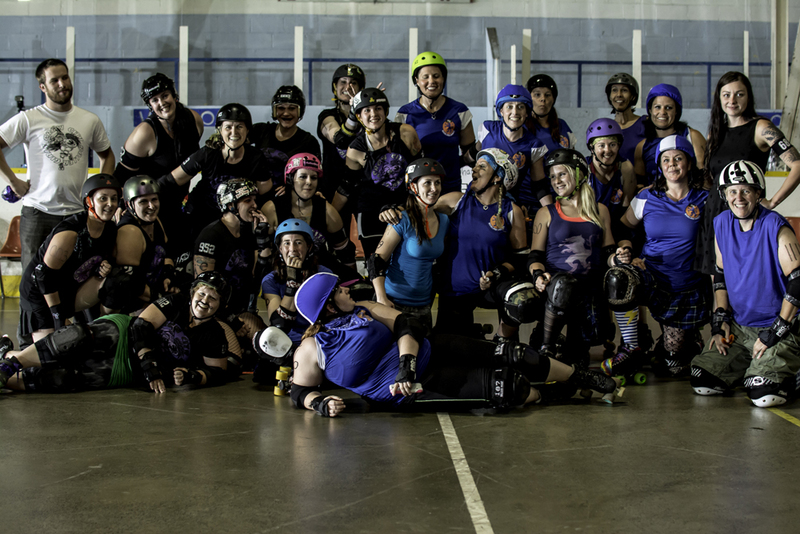 I competed in The Fresh and the Furious IV in 2013 as part of Crow City Roller Girls’ tiny team of seven skaters. People thought we were crazy to skate with such a small roster, but my first year at Fresh was a wonderful experience I will always cherish. Skaters may only compete in The Fresh and the Furious once, but my switch to team zebra enabled me to return to the tournament this year, skating once again on a crew of seven but this time as part of the much larger team of skating and non-skating officials required to oversee a full-day, two-track tournament. Fresh V took place on July 12, 2014—2 years to the day since I participated in my first ever roller derby practice. I could not have hoped for a better “derbyversary” gift. It was a privilege to be chosen to officiate this tournament and a joy to work with such a talented crew, skating six games together over the course of the day. Rainbow Dragon celebrates her 2-year derbyversary with The Meatgrinders officiating crew at The Fresh and the Furious V.
The Fresh and the Furious is designed primarily to provide tournament play experience and learning opportunities to first year skaters, but I learned a lot my second year at Fresh, both about my new role in roller derby and about myself. Most importantly: I learned that I love refereeing every bit as much as I loved playing roller derby. Two years into my roller derby career the zebra’s stripes are feeling comfortable on this dragon’s skin and my future looks bright. Roller derby may be a harsh mistress, but I love her still. Which brings us back to this past weekend and my final game as a roller derby competitor. When I made the decision to become a referee I contacted the roller derby leagues closest to me to let them know I am reffing now and to ask them to keep me in mind when staffing their skating official crews. Of course my contact list included the league which birthed me into the world of roller derby: Crow City Roller Girls. Alas, when I contacted Crow City they informed me that I would not have the opportunity to ref any CCRG home games. The remaining members of the league had been forced into the same decision I’d had to make last October: they could no longer sustain such a tiny league. Crow City would have no more home games. The league was folding. They did, however, have one final away game to play. Crow City Roller Girls invited me to join them for that final game, not as an official, but for one final time as a member of the team. The location was far away. The timing was bad for some very big reasons. And I’d given up playing roller derby. I was a ref now. But how could I refuse to skate in the last flight of the murder? Crow City’s final game would feature my former teammates Wicked Pissah and Abstract LabRat—derby sisters who’d gone through fresh meat training with me—as well as, of course, Greta Garbage—Crow City’s founder and the woman who introduced us all to roller derby. Skating alongside them would be Kara Scene—my own fresh meat who I’d helped train back when I was still leading practices for CCRG—and guest skater Ginsane Bruiser—the woman responsible for introducing Greta to roller derby. Four generations of skaters all on the track together, and I’d been invited to be a part of it! Of course I said yes. Of course I, once again, asked everything else in my life to make sacrifices so I could play roller derby. 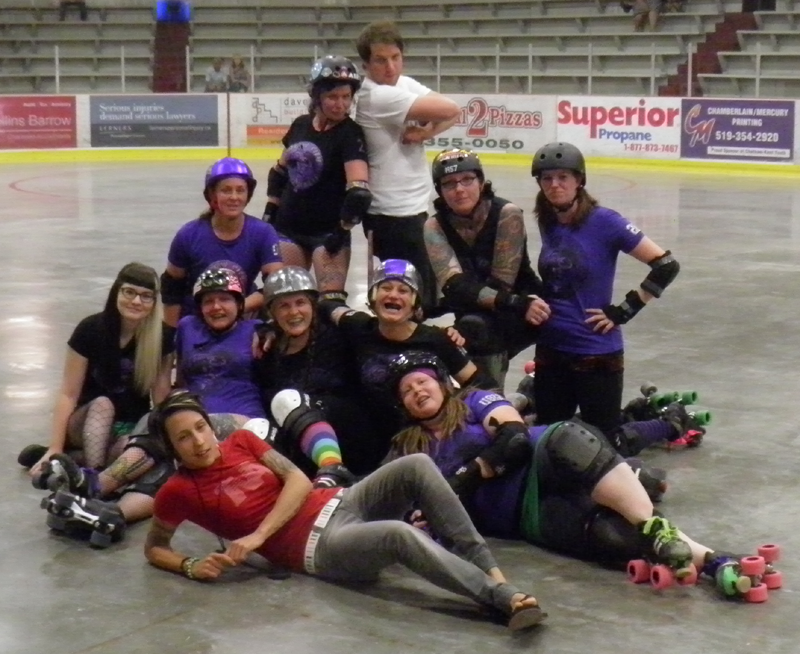 Of course I joined additional guest skaters from Tri-City and Los Coños: Stacie Jones, REZISTA, Lalie Deadman, Reckless Rabbit and Amy Feral Foul-Her in filling out the Crow City ranks. Of course I made the trek to Alliston with this team, our bench staff Sweet Mother of Quad and Cruella DeKill—another freshie I’d helped to train—and Kozmic Khaos—yet another of my freshies, passed her minimums but sadly sidelined with a (non-derby) injury—who came to cheer us on from the suicide seats. As much as Fresh V was a wonderful derbyversary gift, Crow City’s final game was an even greater retirement party. Everything about this game, from the coming together of our own team to the skill and sportswomanship of our opponents, Grey Bruce Roller Derby’s Highland Dames, from the hospitality of our hosts, Misfit Militia to the dedication of the referees, NSO’s, paramedics, announcers, photographers and bout production volunteers who worked a long night to make our game possible epitomized the very best of what roller derby can be. Last Flight of the Murder: Crow City Roller Girls vs. Grey Bruce Highland Dames, Alliston Memorial Arena. Photo courtesy of Joe Mac, Midnight Matinee Photography. We had so much fun Saturday night, even the rain decided to get in on the action. By halftime the roof was leaking—right over the jammer line—forcing our NSO’s to run out onto the track before every jam to mop up the water and keep the track safe for us. 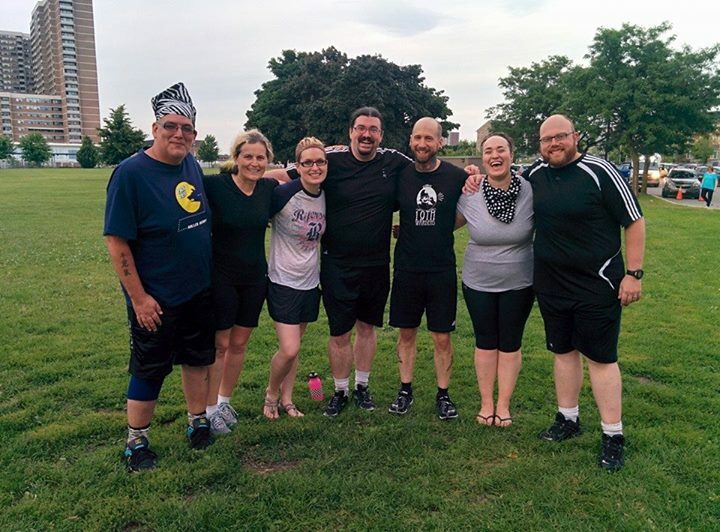 It seemed a fitting send off for a league which trained outside in a parking lot. I am so thankful for the opportunity to have been a part of Crow City Roller Girls’ final game. I skated every other jam, slapped the old star target on my helmet several times, and yet made it through the game without injury and (my new zebra teammates will be glad to know) without a penalty. I think, however, my proudest moment in the game came when I was blocking for rookie jammer Kara Scene. I managed to make a hole for her right at the jam start whistle, and Kara saw it, took it and earned a fast lead. Watch out derby world. You’ll be seeing a lot of Kara Scene’s backside as she blazes through your packs in the years ahead. Alas, all things must come to an end, and the final whistle blew on the last flight of the murder all too soon. I weep at having to say goodbye a second and now final time to a league which gave so much to me and to which I gave so much of myself. But my sorrow is tempered with pride for everything the league accomplished in its two short years and comfort in the knowledge that Crow City’s legacy lives on. It lives on in every game I officiate. It lives on in the future derby careers of former league-mates who will move on to skate for new leagues. I think too it lives on in the lives of those who flew with us for a short while but ultimately decided there was not room in their lives, at least for now, for roller derby. This sport affects everyone it touches in ways big and small, and there are many—including myself—who might never have known the wonders of roller derby if not for Crow City Roller Girls. All my love, respect and gratitude to the best murder of crows ever. We did good my friends. We did damned good. The very best murder of crows: Crow City Roller Girls. Laura Rainbow Dragon writes, dances, cooks, runs, and makes wine–amongst other pursuits–in a way-too-small town in Southwestern Ontario. 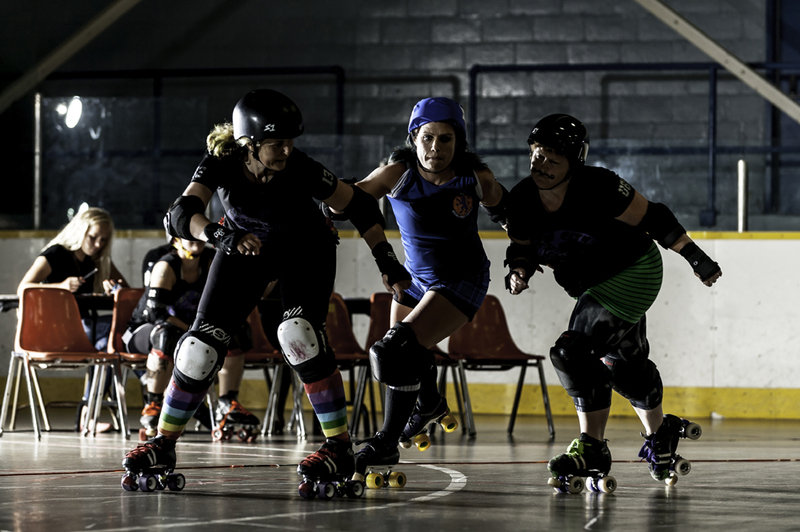 She skates with the zebra dazzle and officiates roller derby games throughout Southern Ontario. Laura has moved house far too often but found a home she loves in the roller derby community. Thanks for sharing your story with us Laura! Thanks for having me. I’m always happy to proselytize for the church of roller derby. Sounds like you had an outstanding run as a competitor. Good luck in the stripes! Thanks for the great post. Thanks Tracy. I’m looking forward to my future with the dazzle. Thank you, Viola. And thanks to you and your team for a wonderful final game.